Some Wyoming White Clownfish have a black spot immediately behind the gill cover. At first glance, the Wyoming White Clownfish may look similar to the Maine Blizzard Clownfish. However, the Wyoming Whites are a variation of the Ocellaris Clownfish and the Maine Blizzard Clownfish are a variation of the Percula Clownfish. Sea & Reef Aquaculture is the first hatchery to bring this gorgeous designer clownfish back in production after the original producer, C-Quest, stopped the production of this morph in 2010. 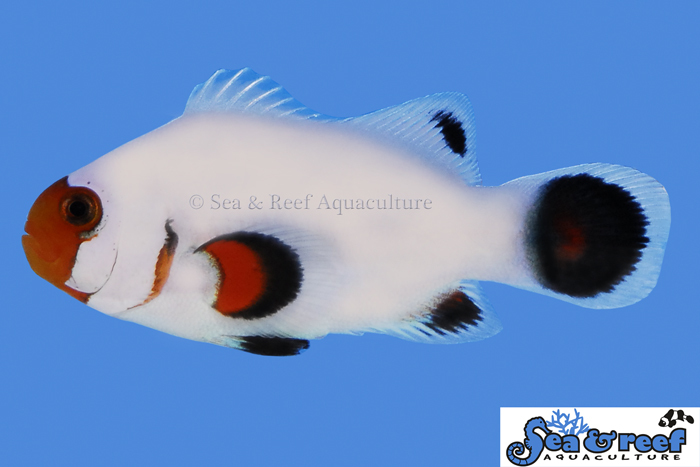 Sea & Reef Wyoming White Clownfish are direct lineage from the original Wyoming White Clownfish produced by C-Quest, which is a 100% ocellaris color variant. The Wyoming White Clownfish has a uniform white coloration. Their fins are dark shortly after metamorphosis and turn jet black as the fish grows. Their orange face will develop a beautiful black outline as the fish mature. Some Wyoming White Clownfish have a black spot immediately behind the gill cover (see picture). To the untrained eye, it can sometimes be challenging to tell the difference between ocellaris clownfish and true percula clownfish. The giveaway is their eyes and the number of spines in their dorsal fins (see picture below). The iris of an ocellaris clownfish is typically pigmented with shades of black and grey whereas the iris of a true percula clownfish is typically a clear orange color. The number of dorsal spines in true percula clownfish ranges from 9-10 with 10 being the norm. In ocellaris clownfish the number of dorsal fin spines range from 10-11 with 11 being the norm. Don’t expect the market to be flooded anytime soon with Wyoming White Clownfish. Our broodstock fish are only producing a small number of Wyoming White offspring with each batch. Please contact Sea & Reef (sales@seaandreef.com) if you wish to be added to the waiting list to obtain this exquisite designer clownfish. We expect to release the first Wyoming White Clownfish in October of 2012. Our broodstock fish are only producing a small number of Wyoming White offspring with each batch. Please contact Sea & Reef (sales@seaandreef.com) if you wish to be added to the waiting list to obtain this exquisite designer clownfish. The temperament and captive care requirements for Wyoming White Clownfish are very similar to that of the regular Ocellaris Clownfish. It is relatively peaceful and hardy. They thrive in saltwater aquariums with or without an anemone present. Wyoming White Clownfish will readily accept a wide variety of host anemones. As a reference, the natural host anemones of the regular Ocellaris Clownfish are Magnificent Sea Anemone (Heteractis magnifica), Giant Carpet Sea Anemone (Stichodactyla gigantean) and Merten's Carpet Sea Anemone (Stichodactyla mertensii).